We took the scenic route to Bolzano. Bolzano is a town in the Sudtirol or South Tirol area of northern Italy. We went through it when we went from Munich to Venice last year, but didn't even slow down. Our good friends Florian and Danielle, their son Sebastian and Florian's mother Christine were returning to the Hotel Gantkofel for a week of hiking and good food. 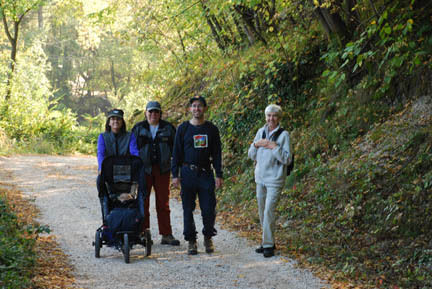 We joined them for 3 days of hiking, castle exploring and museum walking. Here we are headed up the hill to a gasthof for a beer and lunch. Here we are, Sebastian in the stroller and then, left to right, Danielle, Kathy, Florian and Christine (and I'm behind the camera). 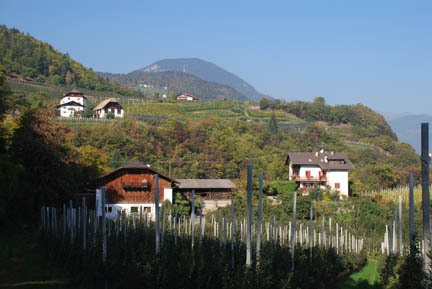 The area grows a lot of apples and grapes and has a very Alpine look to it. We are headed for the place in the center top of the photo. And when we got there we found out it was closed on Tuesdays (guess what day this was). Florian and Danielle had some snacks with them, so we ate that and went back down. Then we drove to an even higher gasthof and had beer and a meat and cheese platter. This is the view from that gasthof. 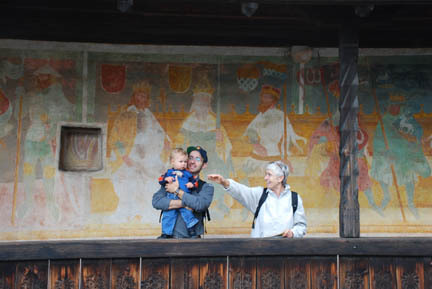 The next day we went exploring a Castle Runkelsheim and looked at beautiful frescoes from the 12th century. Look behind them at the wall. There were even better ones inside but no photos were allowed. 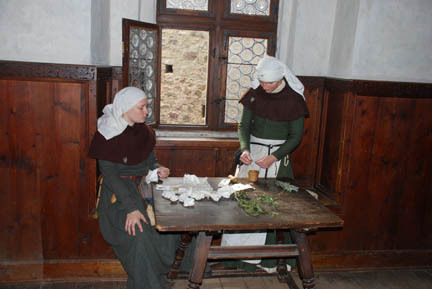 There were several people in period costume doing daily chores around the castle. They even put on a small skit for us, too bad it was in German. Yes, I know we are in Italy but German is the first language of this area. All the signs are in German first then in Italian. We also went to see Otzi, the Ice Man. He is a 5,000 year mummified man found in the Alps in 1991 by some hikers. No pictures were allowed so there are none for this section. He was recovered with his clothes, weapons and tools; all of which are on display with him. It was very interesting the technology of the day in 3,000 BC. He had goat and bear fur clothing with a grass cape or rain coat. He had grass filled fur boots and goatskin leggings. The sewing of his garments was quite intricate and well done, but in spots had been repaired poorly, probably by himself. There was a bronze ax and some arrows and a bow he was in the process of making near the body. He had a bark carrier (shaped like a large tin can) that he carried a coal from the fire in in order to make his next fire. He was wounded and was probably being pursued by his attacker when he died in a small draw on the mountain top. By examining his stomach and clothing the researchers found minute pieces of grain and various minerals that indicated where he had spend his life. He was well traveled in the local area. He was not an old man but was in at least middle age and probably a man of importance in his town. As you can tell we enjoyed the museum. Then we walked through the pedestrian streets in the old town of Bolzano and came across a small brewpub, where we had a beer and lunch. 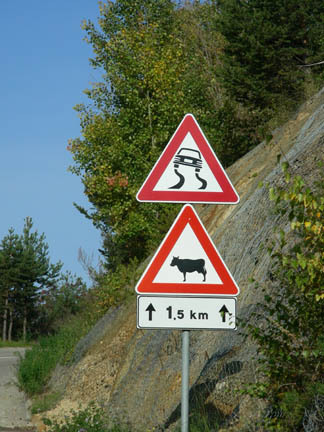 The next day while riding up to another village we saw this sign, maybe if they kept the cows off the road it wouldn't be so slippery. Several times, both in the US and Europe we have come up behind cattle and/or sheep being herded down the road from one pasture to another, and they do leave a slippery mess behind! 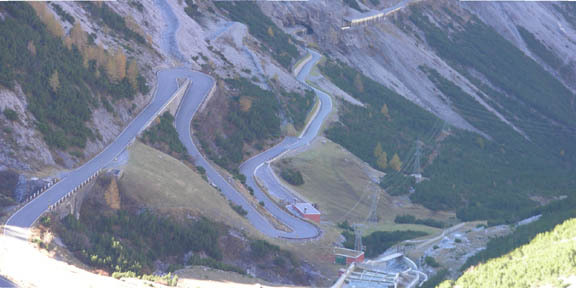 But before we got to Bolzano we had to go over one more pass. Passo Stelvio is the one. 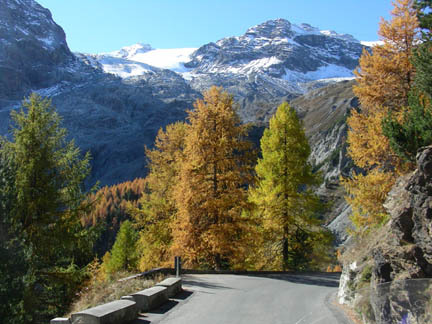 It is a famous pass because it has 33 switchbacks on the south side and 48 on the north. 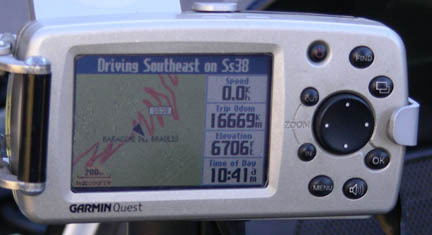 We traveled up above the tree line on this road (on the south side). Then we went down this side. And back into the fantastic fall colors of the pines and larches. 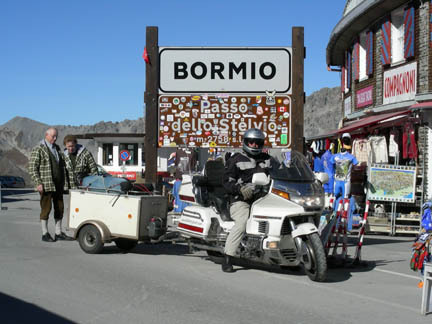 We had a great time on one of the most famous motorcycle roads in the world! After the wonderful time with our friends at the great Hotel Gantkofel we had to go. We want to see the Naples area (with Pompeii) and Rome before we leave Italy.